Suzuki of America recently announced that it will no longer sell passenger vehicles, focusing instead on its more successful motorcycle, recreational vehicle, and outboard motor product lines. Given some of the relative crap that Suzuki sold in the States (see below) - which did not precisely mirror what was sold here - and Americans' general disdain for smaller vehicles in general, Suzuki USA's weak sales aren't really all that surprising. Part of the blame lies with General Motors. GM used to have a good-sized stake in Suzuki, and numerous Suzuki products were sold in both the U.S. and Canada wearing various GM badges, particularly from the mid-eighties to the late nineties. The Chevy Sprint? A Suzuki Forsa. Geo Metro? Suzuki Swift. Chevy/GMC/Geo Tracker? Suzuki (Grand) Vitara. GM's CAMI assembly plant in Ingersoll, Ontario was originally a joint-venture, building Metros and Trackers, eventually returning the favour with an expanded version of the Chevy Equinox being sold as the Suzuki XL7. Well, sold by the dozen, anyway. The Suzuki/GM relationship soured somewhat when General Motors bought ailing Korean automaker Daewoo in 2001, giving the General ready access to a newly redesigned generation of compact and subcompact cars built in a relatively low labour-cost country. In the U.S., doubtless with GM's influence, Suzuki ended up shilling several Daewoo products as their own; versions of the Daewoo Lacetti, sold in Canada as the Chevy Optra and Optra5, became the Suzuki Forenza and Reno, while our Chevy Epica (actually Daewoo's flagship, the Leganza) was their Verona. Worse yet - in an insult to everyone - the Chevy Aveo (sold in both countries; it was the four door version of the Daewoo Kalos) became Canada's Suzuki Swift+. I'm guessing the "+" was to differentiate it from the vastly superior "nonplussed" Swift sold in the rest of the world. GM's financial troubles eventually resulted in GM selling most of its stake in Suzuki, which has since gone on to form a co-operative agreement with Volkswagen. Maybe VW was flattered by the startling resemblance between Suzuki's Kizashi and the 2006 Jetta. While the loss of car and truck sales in the U.S. may be detrimental to Suzuki on the whole (or maybe not, if it was losing money doing it, as this pull-out suggests), this could well prove to be a golden opportunity for Suzuki Canada. Previously, Suzuki's American operations would have had an overpowering influence on product-planning decisions. Now Suzuki Canada is effectively master of its own destiny, at least within the confines of what its Japanese parent allows. Rather than try and move upmarket, as they did with the coolly received (but actually quite respectable) Kizashi, they should play to their strengths. The Canadian market is much more Euro-centric, particularly in Quebec. We like smaller cars than our southern cousins. Suzuki's specialty is building small cars profitably, to the point where they build or license small cars globally for brands as diverse as Fiat, Subaru, and Nissan. They make small, we like small - sounds like a good match. I'd suggest that Suzuki Canada's first move be to bring in the real Swift, and do it, well, swiftly. There's a four door version of the two door hatch seen in the above photos that's nearly as good-looking, and from all accounts that I've read, it's a really nice car to drive too. So c'mon, Suzuki Canada, bring on the Swift. And don't forget to market it. To find out more about the Swift, and to see some of the models Suzuki offers in the rest of the world, check out their global website here. Lest anyone get the impression that I live to pick on GM, rest assured that it is a regular occurrence to find questionable design or engineering choices from virtually every automaker. If it hasn't happened for me with a particular brand yet, it's probably because I simply haven't had to work on many of that brand's products. Today's example is a Ford Edge. I think this one is a 2007, but they're the same from 2006 on, as is the Edge's Lincoln MKX twin. 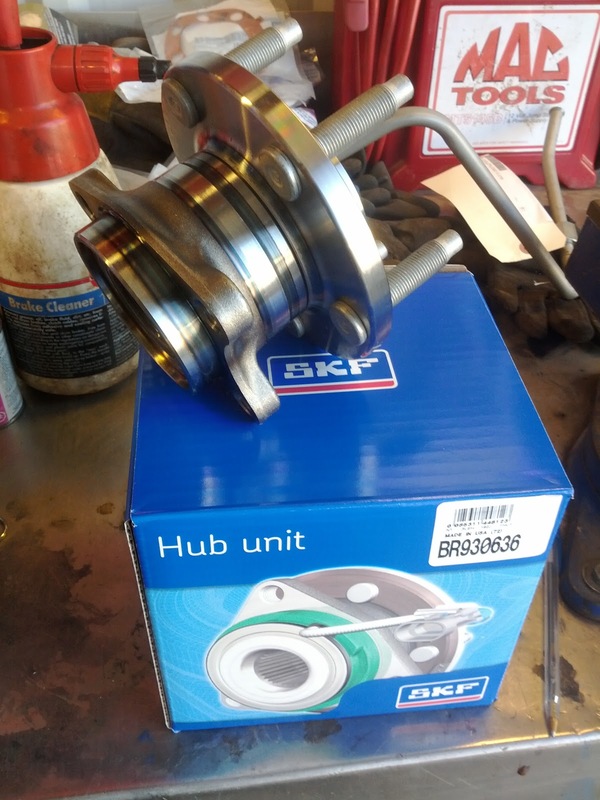 Wheel bearings, a.k.a "hubs" or "hub assemblies" are by nature wear items, though there are a great number of vehicles that reach the end of their service life never having had one replaced. All the same, you've got to figure there's a decent chance that someone will need to replace them at some point, so why not make them relatively easy to replace? You'd think this would also make them easy to install during assembly, right? 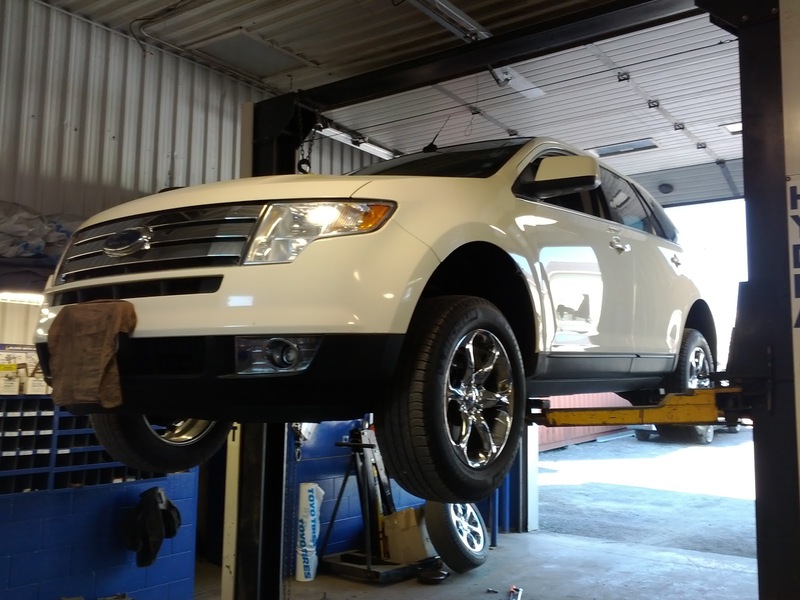 Ford Edge rear axle as seen standing beneath the cargo area, facing right rear. Note the hidden Torx bolts. Meet the Ford Edge. In a front-wheel drive Edge those Torx-head bolts seen above would be sitting in a wide open space. Not so with all-wheel drive Edges, since the rear CV shaft (axle) and its large ABS tone ring (the toothed piece, which is part of the ABS sensor) do a good job of blocking service access. 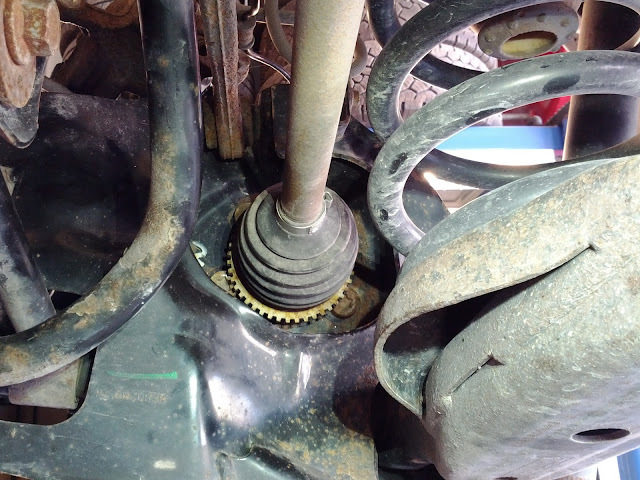 Clearly, this suspension arm is assembled prior to there ever being a driveshaft in the way. Detail view of rear hub assembly fasteners. 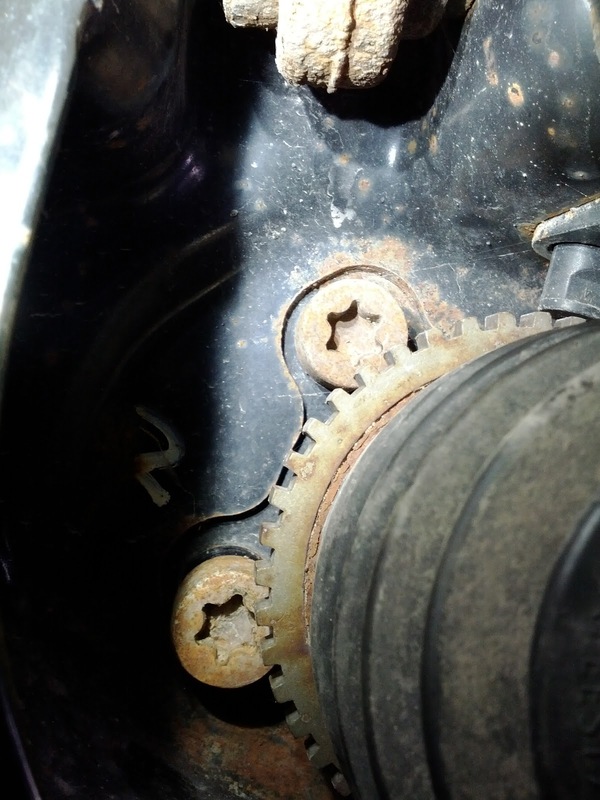 Because they're so close to the ABS tone ring (don't dare damage that - ABS issues can result), and because there's only a direct, straight-line access to one of the four bolts (due to interference from the rear springs, etc. ), they're an awkward nuisance to work with. Almost makes the Volkswagen Tiguan's rear hubs seem user friendly. As a bonus, it does give your friendly technician an opportunity to buy yet another expensive tool set that he/she will use infrequently at best - and even this specialized tool had to be partially disassembled (Torx bit removed from its socket to be turned by a wrench instead) just to remove and install one of the bolts. 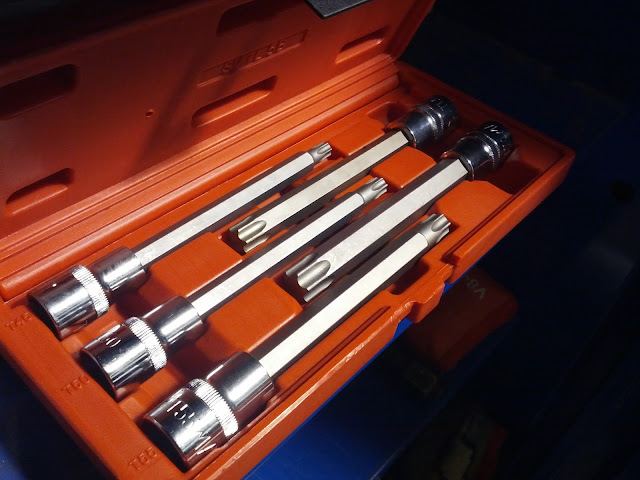 Long-reach 1/2" drive Torx socket set. 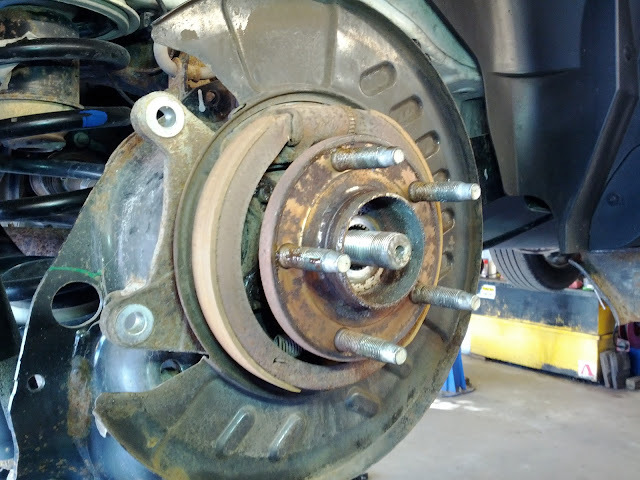 The spread of the bolt pattern could have been a few millimeters wider, or, better yet, the bolts could have been fastened from the other side through the hub flange. Conventional hex head bolts could have been used. Exterior view of rear hub with brake assembly removed. For making this part more difficult to service than is really necessary, Ford (and maybe Mazda), please allow me to present you with a Jackass Award. Admit it - you were curious what this part looked like, right? 2013 Ford Fusion Hybrid, as appearing at AJAC's CCOTY "TestFest"
You can find my Wheels coverage of the "Best New Family Car (over $30k)" category's entrants here. Please note that this article, and the one that follows, were written prior to the release of the actual winners, so my (apparently incorrect) guesses are included, as well as some minor tinkering from the Star's editorial staff. 2013 Ford Focus ST, as appearing at AJAC's CCOTY "TestFest"
You can read my Wheels coverage of the "Best New Sports/Performance Car (under $50k)" category's entrants here. You can find my Wheels preview of Mazda's handsome new 6 here. You can find my Wheels review of Chevrolet's 2013 Spark here. 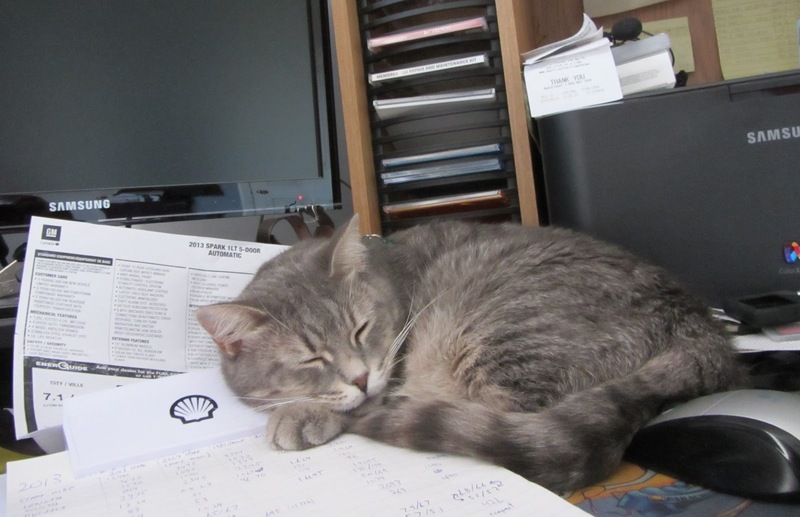 No, the Award's not for the cat. Shelby is just doing what cats do best - she's stalking a mouse. And sleeping. Which is what I've been doing recently with this blog. For leaving this blog unattended and in dire need of an update, I'm going to have to give myself a Jackass Award. See? No favouritism here at Loose Nut.